Recent Updates to the TNM Staging System: Section 7.b. This page is 7B updates to the TNM staging of breast cancer. Back to 7A breast cancer staging. Forward to 8A breast cancer treatment. NOTE: There have been some recent updates to the American Joint Committee on Cancer (AJCC) staging categories. So, the Eighth edition of the AJCC Classification of breast cancer tumors was revised as of January 2018. Don’t worry, all the latest information will be coming to our site really soon. Gene Expression: Medics perform tests, such as Oncotype DX and MammaPrint that examine the pattern of genes within the tumor cells. These tests help predict the likelihood of recurrence of a tumor after treatment, especially in early stage breast cancer. 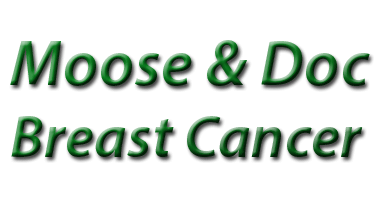 For the time being, we have a few links to ALL the latest information about the recent updates of breast cancer staging. However, the new revisions have made the staging process a little more complex, rather than less so. There are also some online calculators to help you with staging. If in doubt, always ask your treating clinician for more information on staging. Observed survival rates for more than 200,000 breast cancer cases that were diagnosed between 2001 and 2002 and analyzed by the U.S. National Cancer Data Base to re-evaluate the clinical prognostic value of the AJCC TNM classification categories. AJCC TNM. Is this alphabet soup? The TNM is like a special lingo for talking about cancers. Everybody needs to know the T stands for tumour, the N stands for Nodal involvement and M stands for Metastases. Specialist consider that using the Vernier and light microscope for breast tumor measurement is the most accurate for small invasive breast cancers. Furthermore, the pathologist’s tumor measurements are the most accurate for larger invasive breast cancers, especially with multiple tissue block samples. Paget’s disease that is not associated with an underlying invasive breast cancer is classified as Tis (Paget’s). Not really a change, just making it official that the pathology report measurements take precedence, in case the radiology report of a small tumor gave different measurements. Specialists should estimate the size of non-invasive breast cancer, such as ductal carcinoma in-situ (DCIS) and lobular carcinoma in-situ (LCIS), if precise measurement is not possible. Although this may influence therapeutic decision-making, it does not influence the pT stage. In addition, the pathologist will base the T stage for multi-focal carcinomas upon the largest tumor focus and not on the sum of all tumor foci. The new 2012 American Joint Committee on Cancer (AJCC) TNM staging of breast cancer guidelines have emphasized more stringent classification of isolated tumor cell clusters and single cells found in lymph nodes. Stage I breast cancers have been sub-divided into stage IA and stage IB; stage IB includes small tumors (T1) with exclusively micro-metastases in lymph nodes (N1mi). Thank-goodness. Doctors were quibbling too much about micro-metastases. Sheesh, even single cells were scaring people, with words on a piece of paper, about 1 cell, just 1 cell, seen amongst everything else normal in the whole lymph node. So micro-metastases in lymph nodes aren’t scary. Correct. It’s all stage 1. Stage 1 survival is excellent. Small clusters of cancer cells found in lymph nodes, not exceeding 0.2 mm, or non-confluent clusters of cancer cells not exceeding 200 cells in a single histologic lymph node cross-section are classified as isolated tumor cells (ITC). The AJCC updates of the TNM staging of breast cancer clarifies and restricts the use of the (sn) modifier. So, when gross examination identifies six or more sentinel lymph nodes (SLN) the (sn) modifier is now not in use. Oh my word, I’m starting to get the hang of it. So, TNM is like a code so T1N1mi means a small Tumour, T1 with micro spread to the lymph nodes, N1mi. You go girl, but I think you’re a bit of a way off your doctorate just yet! The AJCC designates M0(i+), a new category. Thus, the definition of Mo(i)+ is the presence of tumor cells in the bone marrow or the presence of circulating tumor cells (CTCs) or tumor cells in other that do not exceed 0.2 mm. This category does not change the stage and therefore will not influence the specialists choice of breast cancer treatment. Changes that follow neo-adjuvant therapy now have a classification as yc or yp TNM. This new nomenclature is in use when the patient has systemic therapy or radiation therapy before surgery (neo-adjuvant). In addition, the specialist will use yc or yp when there has been no surgery. The specialists can assess the extent of a patient’s breast cancer at the end of the treatment, either by clinical or pathologic means to help direct any subsequent treatment. The yc prefix assesses the clinical stage of breast cancer after therapy, and the yp prefix assesses the pathologic stage for patients who have surgical resection following neo-adjuvant therapy. Pre neo-adjuvant treatment clinical T (cT) should be based on clinical or imaging findings. Post neo-adjuvant treatment T should be based on clinical or imaging (ycT) or pathologic findings (ypT). Now it’s utterly ridiculous. yc, yp, ycT, ypT. Yea. These odd letter combinations, I don’t think they’ll catch on. I think its easier for pathologists and oncologists to use whole words and sentences. A CT scan (computerized tomography) is a form of X-ray imaging useful for creating images of tissues of the body and scanning the entire body. CT images are more detailed than standard X-rays. In clinical staging for breast cancer, CT is particularly useful for identifying metastases in the liver and the lungs. 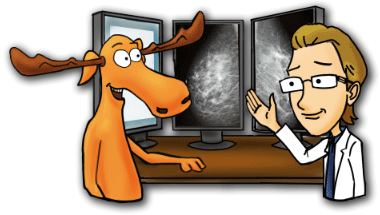 I thought a PET scan was something that Moose should have. I think my pet dog needs a cat scan. Positron emission tomography (PET) is a non-invasive imaging test that uses the cellular function of the tissues of the human body. It is a sensitive way of imaging the spread and growth of cancer outside of the breast. This test is not a routine imaging method. The doctor may request a nuclear bone scanning test to exclude the new areas of bone growth or bone loss that can occur with breast metastases. A chest X-ray is routinely performed in patients who are newly-diagnosed with breast cancer, to exclude metastatic disease. Blood tests may now be useful to look for markers of breast cancer metastases. In some cases, a new technique that examines circulating tumor cells (CTCs) may be used to look for cancer cell gene profiles or for tumor biomarkers that may assist treatment. Blood tests or ‘blood work’ is also done in preparation for surgery and is done during chemotherapy. Stay positive Ladies, and being positive doesn’t mean ignoring the negative, but rather overcoming the negative. AJCC (American Joint Committee on Cancer). Cancer Staging Manual, 7th Edition. Edge SB, Byrd DR, Compton CC, et al (Eds), Springer-Verlag, New York 2010. p.347. This page is 7B breast cancer staging Updates. Back to 7A breast cancer Staging. Forward to 8A breast cancer treatment.